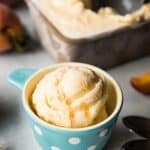 Nothing says summer like creamy, cold, delicious, Old-Fashioned Fresh Peach Ice Cream made with simple, natural ingredients like heavy cream, whole milk, sugar, eggs, and fresh, ripe peaches! Peel and slice peaches, then toss in a large bowl with 1/2 cup of the sugar and lemon juice to combine. Let sit at room temperature for 30 minutes to an hour, until the peaches are soft and have released their juices to create a syrupy liquid. Once the peaches have released their juices, mash them with a fork or potato masher until only very small chunks of peach remain. You don't want large, individual pieces of peach in your ice cream or they will freeze very hard. Strain the juice into a separate bowl, reserving both the liquid and the mashed peaches and refrigerating until ready to use. Meanwhile, in a medium saucepan, stir together the cream, milk, another 1/2 cup of the sugar, and the salt. Heat over medium-low heat until hot, but not bubbling. In a large bowl, whisk together the egg yolks and remaining 1/4 cup of sugar, until light in color, about two minutes. While whisking, slowly pour in 1/2 cup of the hot cream mixture into the egg yolk and sugar mixture to temper the eggs before adding them to the custard base. Slowly add another 1/2 cup of hot cream, whisking the entire time. Pour the tempered egg yolks into the saucepan with the rest of the custard base and stir gently with a wooden spoon for 2-4 minutes, or until the temperature is between 170-175 and the mixture is just thick enough to coat the back of the spoon. Remove from heat and stir in the vanilla. Strain the custard base through a fine mesh strainer into a clean bowl, then stir in liquid from the mashed peaches and refrigerate for 4 hours, until thoroughly chilled. Pour peach ice cream base into ice cream maker and churn according to manufacturer's instructions, until it looks like soft-serve ice cream, about 25-30 minutes. Add the reserved mashed peaches during the last 30 seconds or so of the churning process, then transfer the ice cream to an airtight container and freeze at least 4-6 hours to ripen. Alternatively, if you are intimidated by a custard-base ice cream, you could just use 2 whole eggs instead of 5 egg yolks and skip the process of heating the cream, milk and sugar then tempering the eggs. Just follow the steps of the recipe with the peaches, sugar, and lemon juice, then to make the ice cream base, just whisk the 2 whole eggs really well in a large bowl before slowly adding the sugar while whisking. Stir in the cream, milk, vanilla and peach juices, then continue with the recipe as written to churn and freeze.